"We have enjoined on people kindness to parents; but if they strive (Jahadaka) to make you ascribe partners with Me that of which you have no knowledge, then obey them not..."
In the above two verses of the Qur'an , it is non-Muslim parents who strive (jahadaka) to convert their Muslim child back to their religion. 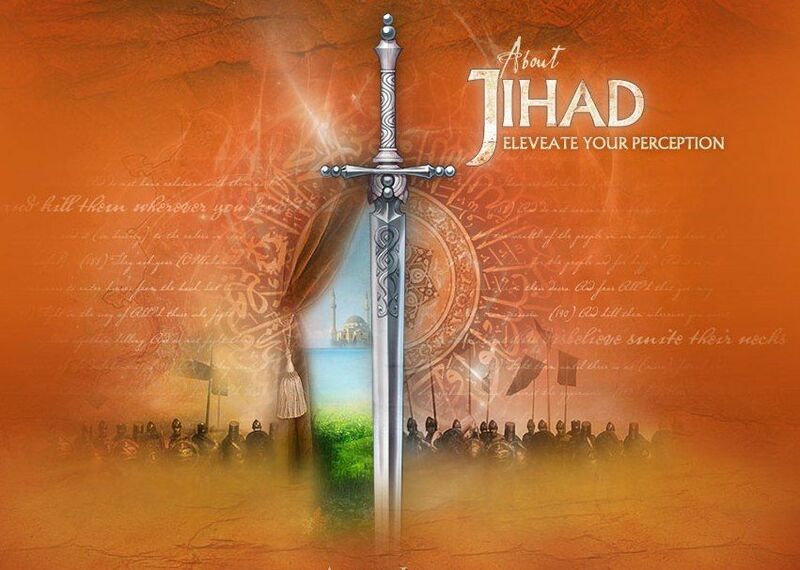 In the West, "jihad" is generally translated as "holy war," a usage the media has popularized. According to Islamic teachings, it is unholy to instigate or start war; however, some wars are inevitable and justifiable. If we translate the words "holy war" back into Arabic, we find "harbun muqaddasatu," or for "the holy war," "al-harbu al-muqaddasatu." We challenge any researcher or scholar to find the meaning of "jihad" as holy war in the Qur'an or authentic Hadith collections or in early Islamic literature. Unfortunately, some Muslim writers and translators of the Qur'an, the Hadith and other Islamic literature translate the term "jihad" as "holy war," due to the influence of centuries-old Western propaganda. This could be a reflection of the Christian use of the term "Holy War" to refer to the Crusades of a thousand years ago. However, the Arabic words for "war" are "harb" or "qital," which are found in the Qur'an and Hadith. "O you who believe! Choose not your fathers nor your brethren for protectors if they love disbelief over belief; whoever of you takes them for protectors, such are wrong-doers. Say: if your fathers, and your children, and your brethren, and your spouses, and your tribe, and the wealth you have acquired, and business for which you fear shrinkage, and houses you are pleased with are dearer to you than Allah and His Messenger and striving in His way: then wait till Allah brings His command to pass. Allah does not guide disobedient folk." "So obey not the rejecters of faith, but strive (jahidhum) against them by it (the Qur'an) with a great endeavor." "And strive (Jadihu) for Allah with the endeavor (Jihadihi) which is His right. He has chosen you and has not laid upon you in the deen (religion) any hardship..."
"And whosoever strives (Jahada), strives (yujahidu) only for himself, for lo! Allah is altogether independent of the universe." "Lo! As for those whom the angels take (in death) while they wronged themselves, (the angels) will ask: 'In what you were engaged?' They will way: 'We were oppressed in the land.' (The angels) will say: 'Was not Allah's earth spacious that you could have migrated therein?'" "Lo! Those who believe, and those who emigrate (to escape persecution) and strive (Jahadu) in the way of Allah, these have hope of Allah's mercy..."
"Or did you think that you would enter Paradise while yet Allah knows not those of you who really strive (Jahadu), nor knows those (of you) who are steadfast." "And surely We shall try you with something of fear and hunger, and loss of wealth and lives and fruits; but give tidings to the steadfast." We find that the Prophet Muhammad(S) and his clan were boycotted socially and economically for three years to force him to stop his message and compromise with the pagans but he resisted and realized a moral victory (2). "As for those who strive (Jahadu) in Us (the cause of Allah), We surely guide them to Our paths, and lo! Allah is with the good doers." "Aisha, wife of the Prophet(S) asked, 'O Messenger of Allah, we see jihad as the best of deeds, so shouldn't we join it?' He replied, 'But the best of jihad is a perfect Hajj (pilgrimage to Makkah).'" "'Should I join the jihad?' He asked, 'Do you have parents?' The man said, 'Yes!' The Prophet(S) said, 'Then strive by serving them!'" "...the Mujahid (one who carries out jihad) is he who strives against himself for the sake of Allah, and the Muhajir (one who emigrates) is he who abandons evil deeds and sin." "To those against whom war is made, permission is given (to defend themselves), because they are wronged - and verily, Allah is Most Powerful to give them victory - (they are) those who have been expelled from their homes in defiance of right - (for no cause) except that they say, 'Our Lord is Allah'..."
"Fight in the cause of Allah against those who fight against you, but do not transgress limits. Lo! Allah loves not aggressors. ...And fight them until persecution is no more, and religion is for Allah. But if they desist, then let there be no hostility except against transgressors." In the late period of the Prophet Muhammad's(S) life, the tribe of Banu Khuza'ah became his ally. They were living near Makkah which was under the rule of the pagan Quraysh, Prophet Muhammad's(S) own tribe. The tribe of Banu Bakr, an ally of Quraysh, with the help of some elements of Quraysh, attacked Banu Khuza'ah invoked the treaty and demanded Prophet Muhammad(S) to come to their help and punish Quraysh. The Prophet Muhammad(S) organized a campaign against Quraysh of Makkah which resulted in the conquest of Makkah which occurred without any battle (4). "If you fear treachery from any group, throw back (their treaty) to them, (so as to be) on equal terms. Lo! Allah loves not the treacherous." Prophet Muhammad(S) undertook a number of armed campaigns to remove treacherous people from power and their lodgings. He had entered into pacts with several tribes, however, some of them proved themselves treacherous. Prophet Muhammad(S) launched armed campaigns against these tribes, defeated and exiled them from Medina and its surroundings (5). "Fighting is prescribed upon you, and you dislike it. But it may happen that you dislike a thing which is good for you, and it may happen that you love a thing which is bad for you. And Allah knows and you know not." "They ask you (Muhammad) concerning fighting in the Sacred Month. Say, 'Fighting therein is a grave (offense) but graver is it in the sight of Allah to prevent access to the path of Allah, to deny Him, to prevent access to the Sacred Mosque, and drive out its inhabitants. Persecution is worse than killing. Nor will they cease fighting you until they turn you back from your faith, if they can..."
"And those who, when an oppressive wrong is inflicted on them, (are not cowed but) fight back." "Strive (Jahidu) against the disbelievers with your hands and tongues." The life of the Prophet Muhammad(S) was full of striving to gain the freedom to inform and convey the message of Islam. During his stay in Makkah he used non-violent methods and after the establishment of his government in Madinah, by the permission of Allah, he used armed struggle against his enemies whenever he found it inevitable. "And why should you not fight in the cause of Allah and of those who, being weak, are ill-treated (and oppressed)? - Men, women, and children, whose cry is: 'Our Lord! Rescue us from this town, whose people are oppressors; and raise for us from You, one who will protect; and raise for us from You, one who will help.'" "Lo! Allah commands you that you restore deposits to their owners, and if you judge between mankind that you judge justly. Lo! It is proper that Allah admonishes you. Lo! Allah is ever Hearer, Seer." "O you who believe! Stand out firmly for Allah's witnesses to fair dealing, and let not the hatred of others to you make you swerve to wrong and depart from justice. Be just: that is next to Piety and fear Allah. And Allah is well acquainted with all that you do." "And of those whom We have created there is a nation who guides with the Truth and establishes justice with it." "Lo! Allah enjoins justice and kindness, and giving to kinsfolk, and forbids lewdness and abomination and wickedness. He exhorts you in order that you may take heed." "Those who, if We give them power in the land, establish prescribed prayers (salah) and pay the poor-due (zakah) and enjoin right conduct and forbid evil. And with Allah rests the end (and decision) of (all) affairs." "Let there be no compulsion (or coercion) in the religion (Islam). The right direction is distinctly clear from error." For the sake of simplicity and easy reading, masculine pronouns have been used throughout this brochure. No exclusion of females is intended. Haykal, M. H., The Life of Muhammad, Tr. Ismail R. Faruqi, American Trust Publications, 1976, p. 132. Haykal, pp. 216, 242, 299 and 414 for the Battles of Badr, Uhud, Al-Khandaq and Hunayn, respectively. Haykal, p. 395 for the conquest of Makkah. Haykal, pp. 245, 277, 311 and 326 for campaigns against the tribes of Banu Qaynuqa', Banu Al-Nadir, Banu Qurayzah and Banu Lihyan, respectively. Also, see p. 283 for the Battle of Dhat Al-Riqa'. Haykal, pp. 284, 327, 366, 387, 393, 443 and 515 for the Battles of Dawmat Al-Jandal, Banu Al-Mustaliq, Khayber, Mu'tah, Dhat Al-Salasil, Tabuk and the Campaign of Usama Ibn Zayd, respectively. Hitti, Philip K., History of the Arabs, St. Martin's Press, New York, 1970, p. 153. Arnold, Sir Thomas W., The Preaching of Islam, a History of the Propagation of the Muslim Faith, Westminister A. Constable & Co., London, 1896, p. 80. Today, there have been 102 visitors (215 hits) on this page!